NEW NORDIC VILLA constructed in Aarhus Denmark in 2012. Front view and entry to the courtyard of the NEW NORDIC ONE BEDROOM. 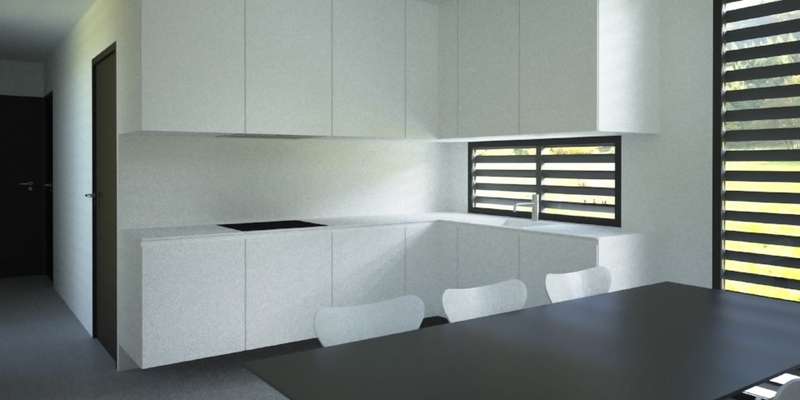 View of the kitchen and dining area of the NEW NORDIC ONE BEDROOM. KUMAR & HOILUND is a design and construction company, developing environment friendly homes based on Scandinavian technology. KUMAR & HOILUND’s mission is to provide environment friendly homes in India with excellent design, a shorter construction time, a lower carbon footprint – and not least at a lower cost. The company is based in Ahmedabad India and was established in 2014 by architects Abhishek Kumar and Mikael Høilund. KUMAR & HOILUND specializes within the fields of architecture and interior design, both residential and commercial and has been involved in a numerous development projects in Scandinavia, London, New York, Milan and naturally India.